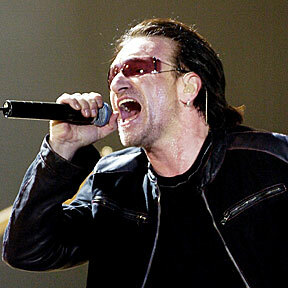 APRIL CONCERTS: U2 lead singer Bono performs during the first concert of U2's Vertigo Tour earlier this year. Bono and his band are headed for Aloha Stadium on April 8, and the Steve Miller Band, no jokers, are lined up for a concert inside Diamond Head Crater on April 1. The soldier is called a hero by superiors for saving his men during a firefight in Afghanistan. An Isle-based agency helps poor families in Manila. U2 is scheduled for an April 8 show at Aloha Stadium while the Steve Miller Band is headed to town for the new Crater Festival on April 1. New greens on the Plantation Course aren't enough to convince Tiger to play at Kapalua. State tourism officials intend to ask lawmakers for more money during the upcoming legislative session. Opponents of Kakaako waterfront development are urging state legislators to block the plans.